Whenever a new technology shows up a new art formis sure to follow. Computer generated art and digital caricatures appeared almost as soon ascomputers had screens: from pictures constructed out of text, to Photoshop-type master pieces. From two-dimensional animation and now on to the explosion of 3-d programs-- allthe way up to computer- generated feature length movies you can hardly tell apartfrom reality. (I'm thinking of Pixar's latest: The Incredibles, and the wholesecond set of Star Wars movies). In a word, the computer has made it's way into everything we do - caricatures no less. In fact there's some awesome computer generated art being done on thespot at regular drawing gigs with 3 tools: Corel Painter, a Wacom drawing board and a "Pixel pencil" (and of course, a lap top computer, so, well, four tools :-). Check these links out below for more info and some great sites. Rhoda Grossman: A caricaturist and authorfrom way back. She's written books on really wild text building techniques (forAdobe Illustrator), and Photoshop techniques, as well as teaches digitalcaricaturing. Rhoda is a sweetheart of a person and it seems like she's alwayslaughing. 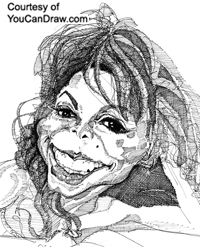 (I met her the National Caricaturist's Convention in San Diego in2000). She draws on a Wacom Tablet (and pencil), into Corel Painter all throughher portable laptop computer. Make sure you click on Rhoda Draws A Crowd"Digitally" button when you get to her site -- that's her computer-aided caricature drawing page. Click here to check out Jeff Mandell's computer generated caricatures. 1) The Wacom Drawing Tablet: Click here to find out more about Wacom Tablets. Buy Corel Painter IX and receive the Getting Started with Corel Painter IX Training CD FREE. and the world of "Goo"
Here's another twist on computer art:digitally distorting photos like Conan O'Brien does on his hilarious"If They Mated" shtick. What's different here from say what RhodaGrossman and Jeff Mandell do above is take an already published photo and reworkit with Adobe Photoshop or in a program Like "Goo". ( Click here to read about "Goo"). Click here to check out Photoshop LE beginner lessons. Click here for a giant page of Photoshop-altered face exaggerations. Click here to learn more about copyrighted photos and Photoshop. 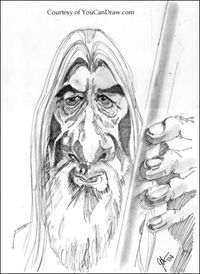 This area of caricature and three-dimensionalanimation programs just explode in opportunities for caricaturists. I mean youcan write and animate your own movie with all your computer- generated caricaturedcelebrities, politicians, and public folks. In fact, as long as your intentionwhen making these little caricatured movies is to graphically animate your highoctane opinion of the person you're lampooning or attacking, you're protectedunder First Amendment freedom of speech constitutional rights. Just like Jib-Jab.If it'syour opinion, then it's your right. So have at it. (But know what comes around,goes around. You are forewarned. :-) ". Click here for the Ted Koppel caricature look-alike animation. Click here to check out some awesome 3-d caricatures of President Clinton. (Click on "Gallery" when you get there. And if you want to see someawesome - and free - 3-d tutorials and really see and get a feel for volume, make sure you click on "Tuts"(tutorials). Click here to check out some awesome 3-d caricatures built by Jim Talbot inAnimation:Master. I know, I'm really pushing this Animation:Masterprogram, but I'm not getting any money for promoting them - I just think it'sthat fantastic of a program. Here's several sites to get you excitedabout extending your growing drawing and caricature skills into the realm ofthree dimensions. The first one is Gary Martin's 3-dimensional cartoon site. Click here to read more aboutAnzovin.com and see how these guys have built a whole business out of 3-d charachter building. Very instructive. Click here to read more about"Animation:Master". Click here for an "Animation:Master" tutorial. Okay! That hopefull got you excited about thedirection computers, animation, and digital caricatures are headed here in they2k's.